The Canadian Well Logging Society (CWLS) announces yearly awards for engineering and earth sciences undergraduate and graduate students in Canada. The purpose of these awards is to raise interest and awareness of careers in Petrophysics and Formation Evaluation. Formation Evaluation and Petrophysics are the studies of rocks and their fluid properties as they pertain to the oil and gas industry. 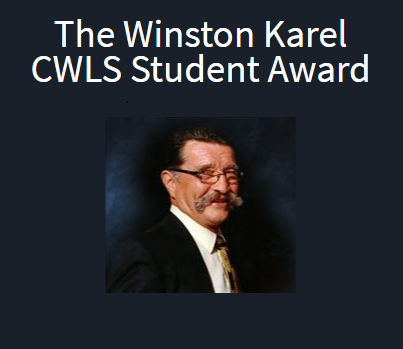 This year the The Winston Karel CWLS Student Award will be funded by Lois Decker, wife of Winston Karel. Winston Karel was a long time CWLS member and friend to the community who passed away on July 1st, 2015. Submissions should critically examine some aspects of well logging, formation evaluation or petrophysics and should be submitted to the CWLS in their final year of study. The final thesis can be submitted at any time in the year of graduation. Submission deadline is October 31, 2019 and the CWLS will select award winners by Mid November of this year. The winners will be invited to the December luncheon to receive the awards and to make a presentation at a CWLS lunch meeting in Calgary later in the year. Student Award Eligibility Criteria: Candidates must be registered full-time at a Canadian university. A student’s financial need will be considered. CWLS IS LOOKING FOR ANY POTENTIAL CANDIDATES TO STEP UP AND PRESENT AT OUR 2018 TECHNICAL LUNCHEONS. IF YOU OR ANY CO-WORKERS HAS AN INTERESTING CASE STUDY WITH A PETROPHYSICS FOCUS PLEASE CONTACT KEVIN PYKE OR SEND AN EMAIL TO INFO@CWLS.ORG. For more Industry Courses click here.